Here's everything you need to know to get started with Deezer on Alexa! How do I set up Deezer on Amazon Alexa? If you have just bought yourself a new smart speaker, you will first need to complete the initial setup steps for your new device. Once you've set up your Alexa-enabled device, you’ll need to add the Deezer Skill. Already set up? Check out the voice commands for Amazon Alexa furhter down in this article. Go to Amazon and sign in to the Alexa web app. Click on Music, Video, & Books. Select Deezer Skilland click Link your account. On the login page, enter your email address and password, and then click Log in. How do I make Deezer my default music service? In the Amazon Alexa mobile app, press Home > Settings > Music & Media. Press Choose default music services. Under the Default music library section, select Deezer, and then press Done. Deezer is now your default music service. Note: US customers, you cannot set Deezer as the default music service at this time. For further voice commands for Alexa, visit the Amazon support site. We'd love to hear what you think of Deezer on Amazon Alexa. Share your feedback and tips & tricks in the comment section! 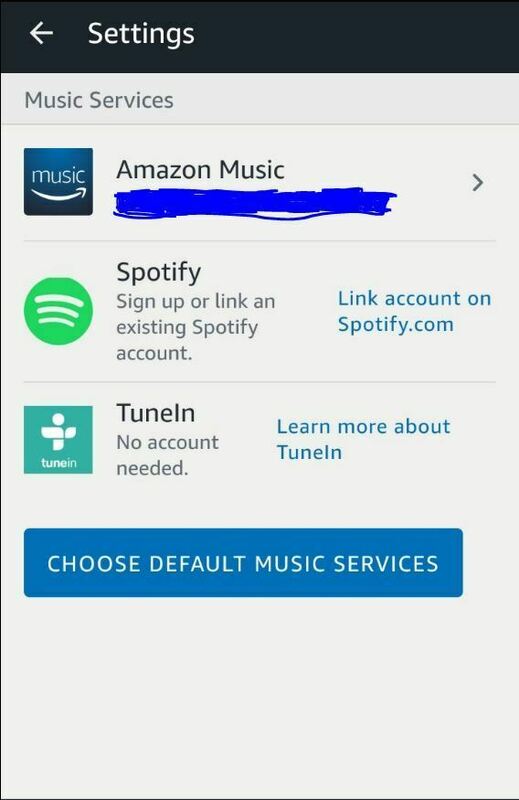 I am in the UK and I have no link under Settings > Music & Media to set up Deezer within Alexa. I have deleted and reinstalled the app on both Android and iOS and the link is not there. See screen shot. Can someone at Deezer look into this as so far I have been unable to get an answer from your support. I have the exact same issue as Resurrected. We can't add it if it's not there to add . For anyone finding it tricky to set up, I have found it's because it's in the app via settings > settings (by clicking the 3 lined settings tab on the upper left after clicking the settings cog, then click) > music & books. Without knowing to click on the settings tab part after going to settings, makes it confusing, at least it does via mobile android. Ok, have set everything up as above, Deezer is my default service and it works....a bit!! If I ask for flow, it works....however if I ask for an artists album like Editors new album 'Violence' or Bon Jovi 'Crossroads' it does not find the album or plays a small portion of a track and then stops. If I ask for "play music by Editors" it will play a shuffle version for a short period of time. In addition, Alexa cannot find playlists! So whats going on Deezer, I have seen many reviews for Alexa and Deezer and they are not good? This is the age of advance technology, get yourselves sorted otherwise I will have to review my subscription service!!! I have to partly agree with the above. This does not seem to have been implemented very well. I find myself asking if Deezer even bothered with a beta testing program. I'm seriously thinking about cancelling my subscription and going back to Spotify as I know that works better with Alexa. More importantly to me is the fact that Deezer don't seem to have attempted to get Amazon to allow the streaming function to Sonos to work correctly, as the FLAC high bit rate which Deezer members pay a premium for will not work when a track is actioned through Alexa and the response given my community managers leads me to believe that Deezer really don't care. Probably because only a very small percentage of subscribers sign up to the premium priced HiFi service. I'll give it a couple of months and if it's not fixed it will be goodbye Deezer. @Resurrected Which of our replies gave you the feeling that we don't care? That's not the impression we were trying to give. We are always checking this and other related topics to make sure we pass on every report or feedback from users. I know that it's not ideal at the moment, as there are some features missing, but we are working hard on it! I wish I could give you more details about the possibility of FLAC quality in the Alexa app, but I'm afraid there are no details as of yet. how do i connect my deezer account to my amazon alexa? Hello @xellalynch welcome to Deezer's online community. In order to connect your Deezer account to Amazon Alexa please follow the steps this article If you need further assistance please let me know. Hi, we've recently tried Amazon, Spotify and now Deezer on Alexa and we much prefer Deezer over Spotify. Appreciate that playlists aren't yet supported on Alexa (is it in the plan?) but what would be a great addition would be he ability to cast from the Deezer app to Alexa . At the moment if Alexa does not understand you you're stuck with whatever random stuff it thinks you asked for. I'd rather not have to switch to Bluetooth but rather manually instruct Alexa/Deezer what to play. This ability might satisfy those that want their playlists if you could manually cast to Alexa. Thanks for adding Deezer to Alexa. Generally works well, however two things. I find it a nightmare to get Alexa to play My Flow. Nine times out of ten she plays some artist called Flow rather than my flow. Second, could you please add the cross fade option as I hate the silence between songs. Can't promise Crossfade on Alexa, but I'd suggest you create a topic on our ideas forum for that so that other users can vote for it We'll keep you posted about any updates! Trying to shuffle my Favourite Tracks via voice command on Alexa however response is always “I cant turn shuffle on for Deezer”. Is this something Deezer is working on to implement? Excellent, thanks for responding! Do you have any timescale for this in mind? so I signed up for deezer 3 month trial for 0.99p my question is why will Alexa not support my Deezer account, it actually says everything is set up and linked but when I ask Alexa to pay anything from Deezer its say Alexa app does not support Deezer - is the 0.99p offer Deezer Premium as I know Alexa does not support free Deezer but this is not free !!!!! I can't stream my music if Deezer on my Alexa.